Thank You for the violin I am listening saying “Bye-Bye!” to November. My November was pretty sad – “No warmth, no cheerfulness, no healthful ease, No comfortable feel in any member – No shade, no shine, no butterflies, no bees, No fruits, no flowers, no leaves, no birds! –November!” – Thomas Hood expresses my feelings. 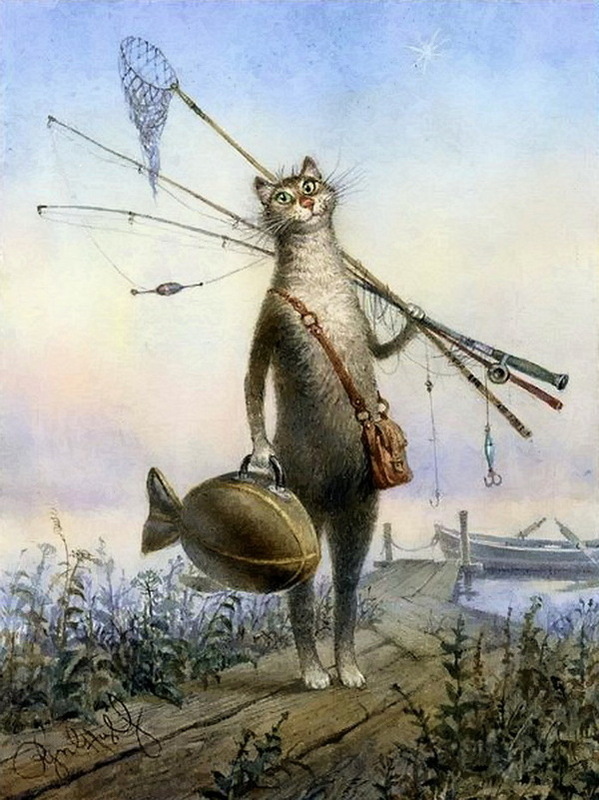 But beautiful November by Max Richer is in my headphones and my favourite cat by Vladimir Rumyantsev makes me smile. Do you remember Vasya? This cat is my lifesaver. Meow, meow, meow are at the beginning, but my eyes are closed, I am concentrated and start to distinguish clear words. “I have found serenity in the most beautiful way. It is in the sounds of violin – no words can describe how peaceful I am now. I am a little envious to those who knows how to play the violin. I would do anything to play the violin. In my dreams I learn to play the violin everyday with various notes and songs. In my dreams I open my case, tighten my bow, pluck a string to tune. 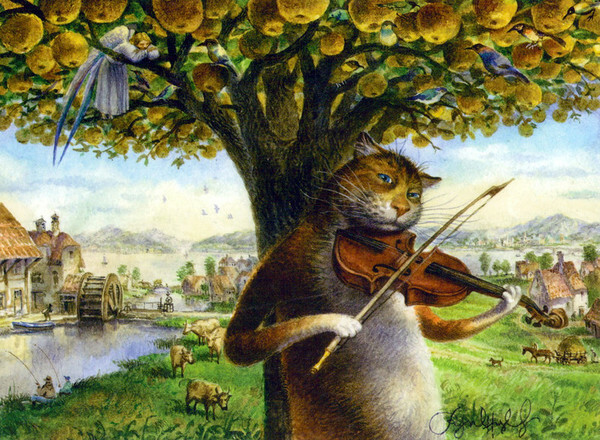 And under apple tree with the sounds of violin Love touches my soul”, Vasya shares his secret with me. “With the sounds of my violin I invite you to go fishing and boating. Let me to read a poem aloud in our boat. Listen “Fishing in Autumn” by Nguyen Khuyen. I fish from a small boat drifting here. “November… Empty branches, fallen leaves, orange, red and yellow became whiter on first snowflakes breeze. Autumn Burgundy is swirling to Winter Whiteness – I hear, I see it in the music! 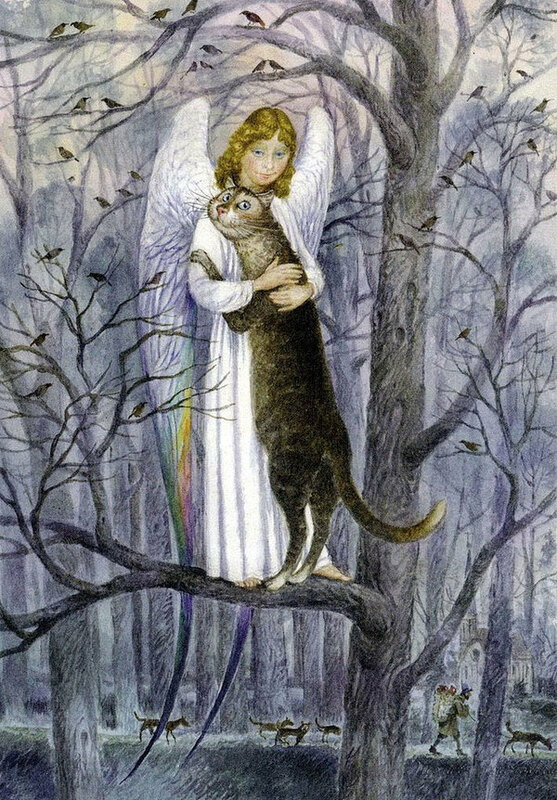 And the music ends with hope – the last day of November is promising happiness because tomorrow we will be hugged by tenderness of Angel of Winter. I know him. You will love him!” Vasya smiles. With the cool wind comes a bright blue sky. With the last day of November comes a new white hope. Please enjoy this outstanding music. I am incredibly happy to have this possibility to share it with you. Thank you. Good Bye, Autumn! Good Bye, November! Thanks once more for a lovely, whimsical and powerful offering. Your words are like balm for the soul. My way to you is long and lighten by your beautiful soul. Thank you for your being with me. Hug you warmly. Your tone, your words, are always so Musical. Amazing. You always sound like you are singing. It saddens me to hear your November was sad. A cat or two to the rescue, along with a good book, Schumann or Tchaikovsky your musical Muse, and a cup of hot chocolate! And write, angel…write! Dear Claudia! Thank you for your support, I try to write. And I will, with a cup of hot chocolate. Cheers :-)! I am entranced by your writing and the paintings are exquisite!